So, as always, there are some versions of Beauty and the Beast with unhappy endings in Beauty and the Beast Tales From Around the World . I actually gave "Unhappy Endings" an index entry and there are three page numbers, thus three tales. And, no, I don't mean unhappy because the transformation occurs as some modern readers like to feel. Some of you want to keep your beast in his original form. But these tales are for audiences in a different time and that was not a consideration for them, at least not obviously to us. The most familiar tale with an unhappy ending will be Madame d'Aulnoy's Le Mouton (in French) or The Ram (in English) which is thought to have partially inspired Villeneuve's original Beauty and the Beast story. The tale is also known as The Wonderful Sheep in Andrew Lang's Fairy Book. So you see that even a princess is not always happy-- especially if she forgets to keep her word; and the greatest misfortunes often happen to people just as they think they have obtained their heart's desires! The king and Merveilleuse in the meanwhile were not aware of the sad tragedy that had just taken place. He proposed to his daughter to ride in a coach, so that all the town might see her by the light of the thousand torches in the windows and in the great squares. But what a sight did she see on her way out of the palace--her dear ram stretched on the pavement, all the life gone out of him! Throwing herself out of the coach, she ran to him, weeping and groaning for she knew her delay had caused the death of the royal ram. In her despair, she was like to die herself. It's amusing, is it not, that Villeneuve in some ways rewrote Aulnoy's tale to give us a happy ending? 18th century fan fiction? Not really, but it's fun to imagine. Another unhappy ending in the collection comes from South Africa and The Story of Long Snake. They went out of the house that the bridegroom might sleep in it. While he was eating, the people of the village piled up bundles of grass, and the bridegroom was burned in the house. In this manner he died. This one, in truth, is not so sad since the heroine is not interested in keeping her bridegroom. He is a snake and there is no hint that he will be disenchanted. Long Snake, however, is reminiscent of another Animal Bridegroom tale with an unhappy ending, Eglė the Queen of Serpents. There is not a version of this tale in Beauty and the Beast Tales From Around the World because I didn't find one satisfactory for translating and including. It is on my list for a second volume if that comes about, however. There are a few versions on the internet with dubious copyrights as well as a fine Wikipedia entry at Eglė the Queen of Serpents. Finally, the third and final unhappy ending in Beauty and the Beast Tales From Around the World is found in a tale that I translated myself for the book, The White Wolf. There are three tales by that title in the book, but this version was originally "Le Loup blanc” from Contes populaires de Lorraine by Emmanuel Cosquin, a French tale. To my knowledge it has never been published in English translation before. After spending another night at the castle, the father returned home. The girl remained and soon began to enjoy the castle. She discovered all that she could desire, each day there were music concerts and nothing was forgotten for her entertainment. The father, upon his return, at first would not tell what had transpired, but in the end he yielded to their entreaties and told them where he had left his daughter. One of the eldest visited the sister and asked her what had happened. The girl resisted for a long time, but her sister persisted and ultimately she revealed her secret. Immediately, they heard horrible screams. The girl stood up, shuddering with fright. As soon as she went outside, the white wolf came to die at her feet. She then comprehended her mistake, but it was too late and she was unhappy for the rest of her life. That one is particularly brutal for she has no second chances, no way to redeem herself for simply revealing the secret which most tales in this group provide so she can find redemption. Which makes it all the more fascinating. Roses by G. R. Mannering will be released next week. A dark, modern rendition of the classic fairy tale Beauty and the Beast! "As the gates clicked shut behind them, she heard the distant roar of a beast." She bears no name. Her silvery appearance is freakish to the numerous inhabitants of Sago, the cosmopolitan capital of Pevorocco in a fantasy realm. With her mother vanishing at the instance of her birth, she is regrettably sent to live with the nouveau riche Ma Dane, where she is punished daily for something, though she knows not what. Tauntingly named Beauty, she flees Sago in a violent uprising that sets out to massacre all Magics and journeys to the furthest point of the country. But Beauty cannot hide in the grassy Hillands forever. Before long, the State officials find her and threaten to take her back to war-torn Sago where death surely awaits. In a midnight blizzard she escapes them, running into a deep, enchanted forest to a great and terrible beast who will bargain for her life. But can Beauty accept Beast? Eternity is a long time. G. R. Mannering's eloquent style and creative retelling of a timeless classic illuminates the plight of Beauty and the Beast and is sure to captivate fans of Cinder, Beauty, and others. One of the most fascinating to me of the Animal Bridegroom tale types is ATU 433B King Lindorm. The tale type has been combined from several earlier AT types (AT 433, 433A and 433C), pretty much all involving serpents, snakes, dragons, lindworms, etc. Wikipedia has an adequate article about Lindworms in general if you are unfamiliar with the term. D.L. Ashliman has several tales of this type listed on his Snake and Serpent Husbands in Folktales page. And really, when we start thinking of all the possibilities of snake and reptile imagery, they are logical choices for Animal Bridegrooms. Many readers may find some romance in an enchanted bear, wolf, dog, goat, rabbit, etc. They resemble pets and can be less fear-inspiring. Well, maybe not so much the goat, but snakes are some of the most feared creatures on the planet. And then there is the phallic symbolism, too. Marriage to a serpent is not very appealing to an innocent maiden. Since this tale type has been combined from several previous, it is a little more difficult to describe. It is tempting to just copy the description from the Uther text entirely! But I won't! Essentially the family of tales describe a young woman marrying a snake. After she marries him, she discovers that he is an enchanted prince. There are not many prohibitions put upon her--her primary goal is to survive her wedding night since in some versions previous brides have failed to do that much. Sometimes simply kissing him (a la Frog Prince which is another tale type) or sleeping beside him will break the spell, but usually the snakeskins must be destroyed in some way. In my favorite versions, the new bride goes to the bridal chamber wearing several layers of clothes, but not from maidenly modesty, but from advice given by a wise benefactor. When her groom tells her to remove a layer of clothing, she demands he do the same, too. She is wearing enough clothing to manage to get him out of his last snakeskin. For some reason, this scene always plays out wonderfully in my head. I can just see her making her own defiant demands as she secretly trembles in fear and strips to her own skin. Sometimes she bathes him in milk once he is naked, or sleeps beside him, or something else, but the snakeskins are also destroyed, thus preventing him from returning to his snake form. Those heroines and plucky and brave and quite fun to read. Often the prince is snake from a childless couple wishing for a child in any form as long as they have a child. A common fairy tale trope. The snake's intelligence and often magical powers are never in doubt, but he is terrifying to even his family who knows him best. And, for once, there is not a Grimms version of this tale. The best known versions are usually Swedish and Danish, although one of the earliest is The Serpent from Basile's Pentamerone in Italy with some strong resemblance to Straparola's even earlier The Pig King, too. There are 19 versions of the tale in Beauty and the Beast Tales From Around the World . And on that note, since I mentioned it already in this post, ATU 440: The Frog King or Iron Henry is also an Animal Bridegroom tale and it bears little resemblance to King Lindorm. I only included one tale from ATU 440 in Beauty and the Beast Tales From Around the World , however, but because the very first SurLaLune collection was The Frog Prince and Other Frog Tales From Around the World: Fairy Tales, Fables and Folklore about Frogs . Occasionally I will use the same tale in multiple collections, especially ones I have translated myself, but I didn't want to take a whole chunk of one book and put it in another one. I now have enough material to expand that original Frog Prince collection, but it will be a little while before a second edition is considered. I'm way behind on announcing new book releases for October and November. There are a lot! So I will work at catching up this week. Once Upon a Time: New Fairy Tales edited by Paula Guran was released earlier this month in paperback and ebook. The list of authors and tales is a happy one. I haven't read this yet and I have to admit the cover is my least favorite part--it looked self-published at first glance. But these are all new stories from established authors and many SurLaLune favorites (and a few of its readers, too). ATU 432: The Prince as Bird is a more common Animal Bridegroom tale type. There are seventeen versions of this tale type in Beauty and the Beast Tales From Around the World . The tale type generally begins like 425B: Beauty and the Beast with a youngest daughter's request for an unusual gift. After much searching, the father finally obtains the gift from a faraway, unknown prince and brings it home to his daughter. She then uses it to summon the prince to her room at night, usually in the form of a bird. (Fill in the blanks there, the tales often let you do so.) The sisters--or in rare cases a jealous husband in less innocent and happy versions!--discovers the reason for the woman's joy and sabotage the window with jagged glass, etc., thus wounding the bird during his next visit. The prince flees home, almost mortally wounded and deathly sick. The daughter discovers the treachery and sets out in search of him. When she finds his kingdom, in disguise, she cures the prince when everyone else has failed. Eventually her disguise is penetrated, she is exonerated, and reunited with her lover. And they live happily ever after. The earliest known version is "The Lay of Yonec" by Marie de France, a tale from the late 12th century. This tale, in turn, is thought to have influenced The Blue Bird by Madame d'Aulnoy in the late 17th century. A version also appears in the 16th century in Basile's Pentamerone as "Verde Prato" which directly translates as "Green Meadow" but is sometimes called The Three Sisters, as one translator explained that Green Meadow has nothing to do with the story. All of these versions appear in Beauty and the Beast Tales From Around the World , but I also included variants from Greece, England, Denmark, Russia, and India. The Russian version may be more familiar to readers, too, as it is commonly known as Finist the Falcon. I enjoy this tale type since the heroine is usually spunky and often guiltless--she never betrays her lover, but still fights hard to save him when she herself is betrayed and falsely accused of the betrayal. Birds are also a common form for Animal Bridegrooms, often in stories where the prince comes to the heroine who is safely tucked away home. A bird shape is one of the more obvious ways for the hero to gain access to a family home and an innocent maiden. One more for today since I hope to finish up the Beauty and the Beast tale types this week. Another less common but a little more beloved Animal Bridegroom tale is ATU 431: The House in the Forest. It can be The Hut in the Woods or any other variation of that title with hut/house, forest/woods, etc. This tale is also a cousin to the Kind and Unkind Girls (ATU 480) tales. This one also has a strong "be kind to animals" message, too. Again, this one is best known from the Grimms. I have long considered making it the 50th tale annotated on SurLaLune. (It is tied with a Grateful Dead tale, actually.) 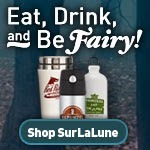 You can read the tale on the SurLaLune site at The Hut in the Forest and it also appears in Beauty and the Beast Tales From Around the World . But with this one I also found another version from Poland for the book titled, "The Bear in the Forest Hut." As I have mentioned before, the Grimms provided many different types of Animal Bridegroom tales in their collection, many the best know representatives of tale types in the ATU 425-449 Animal Husband range. Several of these appear in Beauty and the Beast Tales From Around the World . ...a versified novella from southern Germany of ca. 1200, which was much read in courtly circles. The donkey with human sensibilities is traced to the ancient novelle of Psuedo-Lucian and Apuleius. Prose versions were popularized by the Grimms' text. Oral versions are often so much abbreviated that they are difficult to distinguish from Type 425A. The tale is more recognizable in the Animal Bridegroom family because it contains many common elements, including the nightly changing from beast to human by removing the animal skin and the ultimate burning of the animal skin to end the enchantment. The beginning also starts with a childless couple wishing for a child, any child, and receiving a donkey child as a result. And isn't it fascinating to see that some tales are old and kept a long life from ca. 1200 but still didn't gain the same popularity level of other tales. I have to admit, a donkey is less appealing or enticingly dangerous than many other animals. This tale even emphasizes more of this entertainment qualities--from playing musical instruments, etc. The only representative of this tale in Beauty and the Beast Tales From Around the World is the Grimms' The Donkey. There are more variants, but few are available in English translation. This was supposed to post yesterday. Better late than never! Did you realize that Snow White and Rose Red is an Animal Bridegroom tale? I know it is--I even say so in my history of the tale on the SurLaLune main site--but I often don't think of it as such. I know I am often focused on the two sisters and their relationship with each other as much as the bear. But that bear is an enchanted prince and he is disenchanted by the sisters and then one marries him. The tale is classed as ATU 426: The Two Girls, the Bear, and the Dwarf is very, very rare actually. 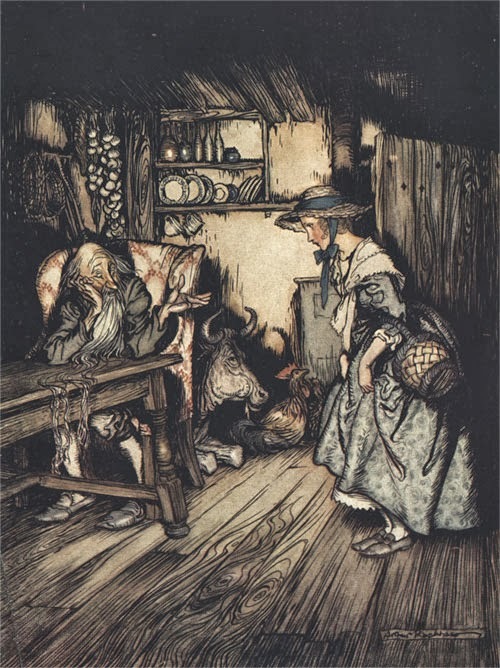 The best know version is the Grimms, although their version is based on a tale, "The Ungrateful Dwarf," written by Karoline (or Caroline) Stahl. I include the tale for this reason in Beauty and the Beast Tales From Around the World . Most other variants are most likely derived from the Grimms version since it was disseminated all over Europe and beyond. Last week I discussed the ATU 425 subtypes A, B, and C. I wanted to share a listing of the other minor subtypes D-P, etc. ATU 425* The Insulted Bridegroom Disenchanted (previously Enchanted Animal Husband Insulted by Guests)--None of these tales are included in my book. AT 425P Enchanted Wife Lost and Found--Folded into ATU 425B--None of these tales are included in my book. These, as you can see from the title, are hero tales or Animal Bride tales which I did not include in the book. There simply wasn't room. That book will come someday, primarily as Swan Maidens since that is the most popular Animal Bride type. I won't go into descriptions for each of these, mostly the significant variation is described in the type title, especially those that were folded into larger types were limited to a small geographic region of Europe. For example, AT 425J Service in Hell to Release Enchanted Husband appears strictly in Ireland as an Irish-Gaelic variant. All of them are fascinating variants of the tales. "If you could tell me, in your opinion, the best non-Disney fairy tale adaptations people should watch?" My list is long, and I really don't want to list them all since I want to encourage everyone else to share. But I'll get the ball rolling. Ever After - A Cinderella Story is first on my list, not necessarily because it is my top favorite, but because about 70% of the reader recommendations will be for this one. So if you agree, yes, say so, but try to add a second and third choice, too, not just this as a top pick. Let's make it interesting. My sentimental favorite is The Slipper and the Rose: The Story Of Cinderella [Blu-ray], which is being re-released to Blu-Ray in November. Hoorah! This is the film I grew up with. It's the one that made me never give up on Cinderella. Be warned it's a musical and Richard Chamberlain "sings." The happy ever after is worked for a little harder in this one. And I LIKE the music by the Sherman Brothers (who also wrote Mary Poppins). No apologies from me, but I admit it's not for everyone. But this is perfect for many Disney fans. And Annette Crosbie is the Fairy Godmother I want. I also offer up Donkey Skin as a very important fairy tale film. Not to everyone's taste but very beloved by those who do. It's French. It's Donkeyskin. It's a classic. It's an iconic film in France, actually. I see it referenced every time I am in that country. And I'm not looking for it either, despite being, well, SurLaLune. Beauty and The Beast (The Criterion Collection) is the most important film to watch in the fairy tale canon. Outside of Disney, it is the most discussed and analyzed by scholars. Pretty much every paper or article about fairy tales and film will cover this one. If it doesn't, it better have an excellent reason or it won't be taken very seriously by those in the know. Again, it's French. Expect subtitles or dubbing. Ditto for The Company of Wolves . The other most analyzed film outside Disney fairy tales. Thanks to it being strange and an adaptation of Angela Carter. Not for the faint of heart. And not in French, but sometimes you'll wonder if you are watching a foreign film. This isn't for converting friends unless they are goth or their tastes veer far away from popular culture. Think more horror art house style. Personally, I'll admit not an entertaining favorite, but it's an important film. Three Wishes for Cinderella (Tri Orisky Pro Popelku) [DVD] is another fan favorite and was the most asked about film for the first five or so years that SurLaLune existed. I wasn't aware of it when I started SurLaLune. Now I know. Not your Perrault Cinderella, more like all the other versions that aren't known in pop culture. Jim Henson's the Storyteller - The Definitive Collection is a cult classic for a reason. While I personally find the Shelley Duvall's Faerie Tale Theatre: The Complete Collection a little too campy and slightly tedious, there are few flaws to be found in this series of tales from Jim Henson and several other heavy hitters from the 80s, including narrator John Hurt (most recently known here in the US for the voice of the dragon in the BBC Merlin series.) I love these but some may disturb younger children, so know your audience. Highly recommended all the same. On the more educational side, I also like Storybook International Collection 10 Disc Set . It is a series by different filmmakers, usually made in the country of origin for the tale. The quality is inconsistent, but we've enjoyed several of these and I still haven't watched them all, more from time than interest limits. There are a lot in here. Expect slower pacing than the average child is used to these days. Finally, I enjoy the Brothers Grimm series by Tom Davenport. Again, not always consistent and these have older production values (as do most of the films on this list), but these linger in your brain. Of course, I am slightly biased since I'm from below the Mason Dixon line and Southern in all the best ways, but these are great renditions of tales, somewhat unexpected. My husband remembers watching them when he was in grade school, but I was never that fortunate. Our sentimental favorite is From the Brothers Grimm: Soldier Jack: The Man Who Caught Death in a Sack . John just referenced it a few weeks ago in casual conversation even though is has been years since we watched it. From the Brothers Grimm: Willa: An American Snow White is one of the best and unexpected ones, also the last one produced, I believe. These are also inconsistent in appropriateness for younger age levels. Come to think of it, both the Brothers Grimm and Storyteller series offered darker renditions of tales 20+ years ago. This is not a new trend in the film industry just happening now. Just kidding! Ella Enchanted [Blu-ray] is my absolute LEAST favorite fairy tale film. I ADORE the book and hate the film which removed anything lovely from the text. There are worst movies out there but none with as big of stars and budget as this clunker. Perhaps if I had been three years old when it was released, I may have liked it briefly. But this was painful. Very painful. And I had a 3-year-old niece who did enjoy it when it was released so I sat through it several times. Never improved with multiple exposures. The loathing only increased. And, yes, it may be okay if you've never read the book, but the book would have made an excellent movie just as it was. Yes, that is a common refrain with readers but this movie, yuck. Prime example of horrid Hollywood rewriting. I'm sure I've forgotten 20 or so titles, but this is a start. Now what do you readers recommend?